The South Philly rowhome of slain ex-mafia don Angelo Bruno — who was shot and killed right out front of the place in 1980 — has apparently been deemed not historic by the city's Historical Commission. According to Newsworks, the commission disagreed with historian Celeste Morello's nomination of the property at 10th and Snyder streets joining the city's Register of Historic Places. Per the report, commission members felt Bruno's impact on how the feds fight organized crime wasn't enough to deem his old home "historic." Morello made the nomination in February. The report adds that commission members felt that Philadelphia already has a number of mob-related landmarks and even infamous gangster Al Capone's former Chicago home failed to gain a similar title. 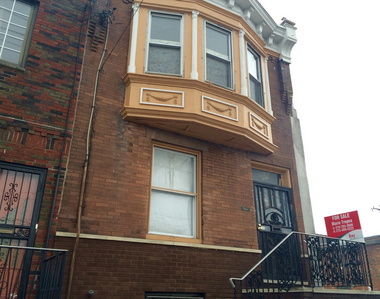 The former South Philly rowhome of the "Gentle Don" could get even more recognition. Bruno — known as the "Gentle Don" was 69 at the time of his death. The hit, which took place out front of the South Philly rowhome along Snyder Avenue near 10th Street, occurred as in-fighting amongst the city's organized crime family continued. Infamous photos of the hit showed Bruno mouth agape while seated shotgun in his car that was parked out front of 934 Snyder Ave.
A real estate agency marketing the property told NJ Advance Media at the time that the nomination wasn't likely to affect the sale. According to the report, there are currently 16 bidders vying for the 1,200-square-foot property.